Published September 27, 2017 By Anna J. This post may contain affiliate links. Regardless, I only recommend sites I've researched and/or used and trust. In the immortal words of Cady Heron, protagonist of cult-classic phenomenon ‘Mean Girls,' math is beautiful because “it’s the same in every language.” Even for those of us who are not necessarily math whizzes, we can understand the beauty of the language, and can see how solving a problem through logic, deduction, and formulas can be a joyful experience. Creative passions do not have to solely exist in an arts vacuum – they can also exist in other humanities, like mathematics, and can universally bond human beings together. That is why working from home as a math tutor can be such a fulfilling, wonderful experience for remote gurus looking to expand their horizons and/or their businesses. If you’re a math phenom, we recommend checking out the following list to learn more on how you can either work from home as a tutor or teacher, become a remote accountant, or perhaps take on insurance underwriting. Intuit – Read Intuit Work at Home Review – The tax company does provide remote opportunities in tax preparation support. They prefer a “highly motivated [individual] with a business background who has “excellent communication and technical skills.” A bonus? You do not have to have an active credential to work in tax support for Intuit. However, if you want to work as a Credentialed Tax Expert, then you do have to have an active credential, i.e., a CPA, EA, or practicing attorney license. Intuit considers it a plus if you are bilingual in Spanish. Schedules are flexible with competition compensation, and even have 401ks, benefits, and child and elder care – all unique features in a remote job! Accounting Department – AccountDepartment.com is a website that offers full-time, remote work for experienced bookkeepers. All employees are also just that: employees, who are full-time, with benefits – this means that you’re not struggling through tax season, trying to find loopholes in how you can deduct a potential write-off. Note that they do only take U.S. applicants at this time, though. This company has several available job openings now for virtual work, so check them out ASAP! BidaWiz – BidaWiz is another remote accounting company for math masters. It offers multiple incentives besides the remote offering, like freedom from associated fees and supplemental income. Average work experience clocks in at around 20 years, but can range anywhere from 5 – 40 years. MathElf – According to the website, tutors at MathElf make $20/hour working from home – not too shabby! Tutors have the ability to set their own hours – even working 24 hours per day, 7 days per week. Tutors are paid on Monday for the previous week’s work, which is a pretty fast payout. There are no setup or materials cost associated with becoming a tutor at MathElf. The only things tutors do already need to have are: iPad running iOS 11, a high-speed internet connection, and over a year of teaching or tutoring mathematics. The website notes that iPads are absolutely necessary, and other Apple devices will not work with their system, so keep that in mind prior to applying. Yup – Yup is another website that offers extremely flexible scheduling for math tutors. Their payment structure is set up so that you get paid for every minute you work – plus, you can earn bonuses based on your performance as a tutor. Subjects that are available for tutors to teach are: math, chemistry, and Physics. Tutors are paid based on experience and mastery of skills, and are paid on a monthly basis via direct deposit or PayPal. Wyzant – Wyzant is a website that many math tutors use to find students that are local to them, or students that want to participate in online lessons, so you truly have double the options with their site. However, Wyzant is not exclusive to mathematical geniuses – if you have experience in teaching music, writing, test prep, or in other art forms, you can certainly sign up to be a Wyzant tutor! This could potentially be a way to earn supplemental income, other than by being a maths tutor. American Public University System (APUS) – The American Public University System offers remote teaching jobs for qualified individuals in the higher education realm. APUS offers benefits, too, and promotes diversity in their policies and practices. You could potentially work as an astronomy professor or in public health, to name but a few current work-from-home openings! K12 – Read K12 Work at Home Review – An online learning portal for elementary students and above, K12 enables teachers to teach online at their convenience through a proven, accredited system. Teachers can work for online public schools, online private schools, or for homeschool programs. Administrative and director roles are also available for remote employees. Connections Academy – Read Connections Academy Work at Home Review – Connections is a tuition-free online school for K – 12 and offers remote employment opportunities for teachers. According to their website, over 92% of parents recommend Connections Academy, so you can be sure of its authenticity and your longevity with the company (we hope!). Geneva Financial – This company is currently looking for “experienced loan officers and support team members throughout the country.” Geneva Financial is also committed to hiring veterans – a unique feature of that company. They strongly encourage growth in their team members as well. Great American Insurance Group – Yet another insurance underwriting company that encourages growth (on the front of their careers page, an employee testimonial reads that she apparently started off as a claims trainee and grew from there), Great American Insurance Company also encourages applicants who are mid-career and want a change to apply. Great American Insurance offers remote as well as in-house options for the insurance underwriter applicant. CrossCountry Mortgage – CrossCountry Mortgage has its own impressive resume; they have already doubled its headcount in 2017, expanded their reach across the nation, and made it a prerogative to award high-performing individuals. Their compensation is competitive, they offer Flexible Spending Accounts (FSA) and Health Savings Accounts (HSA), a 401k with company match, and many other benefits. The company currently appears to have two underwriting positions open, so check them out today! Math may be a universal language that everyone can enjoy, but it is certainly not one that everyone immediately gets – and that’s where you come in, math pro! Use your skills to spread that love of math, or to at least help others figure out what the heck a limit is, and make a little extra dough while doing it. Be sure to let us know how you’re expanding your mathematical horizons! 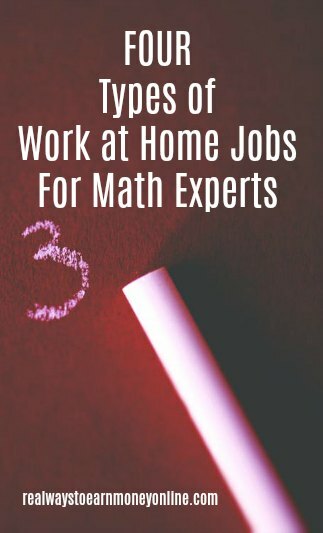 Looking For More Math-Related Work at Home Jobs? If so, you should try out a subscription to FlexJobs. They post daily job leads that are remote and flexible in nature, including jobs in the categories listed above. All of their leads are guaranteed to be scam-free. This is a resource we have thoroughly researched and also use here at Real Ways to Earn. It's $14.95 a month for a subscription, and they make it very easy to cancel if you decide it isn't for you. You can use promo code AFFILPROMO to get 30 percent off your membership.